Not everything happens for good reason. The devastating floods triggered by unceasing rains in the second week of August 2017 spelled a disaster in the life of Bale Nepali, a resident of Bhajani municipality in Kailali. The flood not only destroyed his house and peanut farm but also swept away cattle and chickens, rendering his six-member family starving and homeless. “The floods came early in the morning and it changed our normal life to a tragedy,” says Nepali, who lives near the Pathariya River. “While we were trying to escape, the flood water came in through the door of my house,” he says. Nepali was one of the recipients of ACT member LWF Nepal’s relief package in Bharthaha village of Bhajani Municipality. LWF provided relief to 123 flood-affected families in the village. They were given beaten rice, instant noodle, water, rice and pulse. The people had been starved for more than 3 days. As of August 22, 2017, LWF Nepal has provided immediate relief to a total of 574 flood-affected families in Morang, Jhapa and Kailali districts. LWF Nepal has reached 258 flood-affected families in Jhapa and 210 households in Kailali and 106 families in Morang districts with relief packages that included food, kitchen utensil sets, blankets and urgent clothing items. LWF Nepal and its implementing partner in coordination with District Disaster Relief Committee (DDRC) provided the relief materials. Members of ACT Alliance Nepal Forum have been responding to the humanitarian crisis in different districts. Dan Church Aid (DCA) has been providing relief package that include food, tarpaulins and mosquito nets to flood-hit people in Saptari and Bardiya districts. Most importantly, DCA deployed its staff in Saptari immediately after the flood and partnered with local radio to produce and broadcast information on the flood. 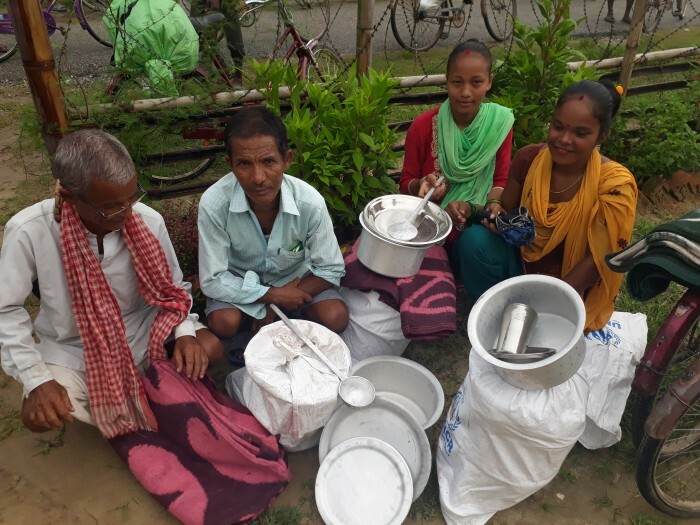 Lutheran World Relief (LWR) has provided food items to 2,376 families in Bardiya and Nawalparasi districts while Christian Aid has been distributing non-food items to flood victims in Bardiya, Banke and Dang. Similarly, ICCO Cooperation has been providing food items to 600 families in Rautahat district. Members of ACT Alliance in Nepal have responded to the emergency immediately. People in Jhapa Rural Municipality (RM) in Jhapa district responded that LWF Nepal was the first organization to reach to their village with relief materials. “LWF Nepal and its implementing partners, which have been working on Disaster Risk Reduction and Livelihood promotion in the village, reached first,” says Jaya Narayan Shah, chairperson of the RM. Similarly, DCA reached to flood affected area in Saptari immediately and it partnered with a local radio to produce and broadcast information on the flood. The radio program was effective to disseminate the information to the affected communities and to collaborate with other agencies working in the district,” says Cecial Adhikari, Program Manager-Recovery Program in DCA. According to the Ministry of Home Affairs (MoHA), the flood has killed 143 people and injured 43 and 30 have gone missing. There has been a huge loss of property particularly the stock food grains, standing crops, seeds, livestock, poultry and fish whose accurate data is yet to come. According to the MoHA, as of Tuesday, around 80,000 houses have been completely destroyed and 144,444 partially damaged. As per the initial reports received from the affected districts, 75 schools in Banke, 58 in Bardiya, 2 in Dang, 20 in Saptari, 178 in Parsa, 37 schools and 5 madrasas in Dhanusha, and 8 Early Childhood Development (ECD) centers in Chitwan have been damaged. ACT Alliance Nepal forum is developing a joint plan to respond to the humanitarian crisis. “Considering the devastation in 18 affected districts in the southern part of Nepal, ACT Alliance is devising a joint plan to support affected population,” says Dr Prabin Manandhar, Country Director of LWF Nepal and Convener of ACT Alliance Nepal Forum.